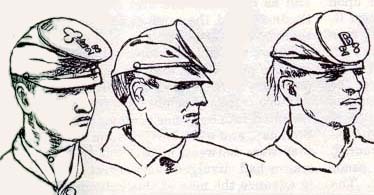 Company letters were worn on the front of the Jeff Davis (Hardee) hat and either front or more often top of the forage cap (kepi). 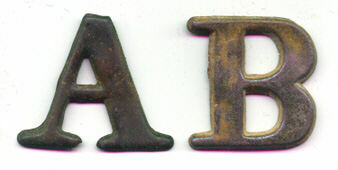 The letters "A" and "B" were recovered from an unknown site. The letter "D" was recovered from a site near Frederick, Maryland. 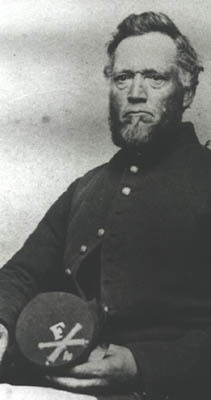 The letters "F" and "I" are Civil War surplus. They are stamped in brass and one inch high with wire loops soldered on the back for attachment to the hat. 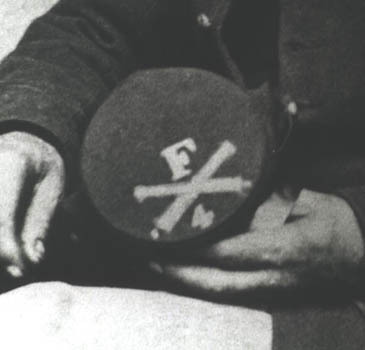 The photograph below shows the letter "F" (identical to the above example) being worn on a kepi (forage cap) by a rather old looking artillery private.